How to bring people to work together as a team? We all know the benefits and challenges of working and managing teams. Having a deep understanding of what makes a team will allow you, the manager, to maximise your team members’ potential and minimise any unwanted issue. Read more: [Infographic] What Makes a Successful Team? According to Brian, the first step in team building is to identify the required skills to build the team and evaluate the existing skills that your members possess. This step is essential in assessing the skill gaps among your staff. Once the skills and the gaps have been acknowledged and thoroughly examined, it is time to close such gaps with either personal or group training. Brian also emphasised the importance of rewards and quality feedback in order to motivate the team. Moreover, it is unavoidable for conflicts to occur in a team setting. Sometimes, a little conflict is necessary to drive your members forward, but too many are unhealthy for any type of relationship, especially in a team. Teamwork does not happen on its own. It needs to be catalysed and adopted as an integral part of the workplace culture. Team culture can be driven from the top down or from the bottom up. From whichever direction, it is undeniable that teams are indispensable in every organisation. The second half of the Talk was dedicated to discussing quality management. 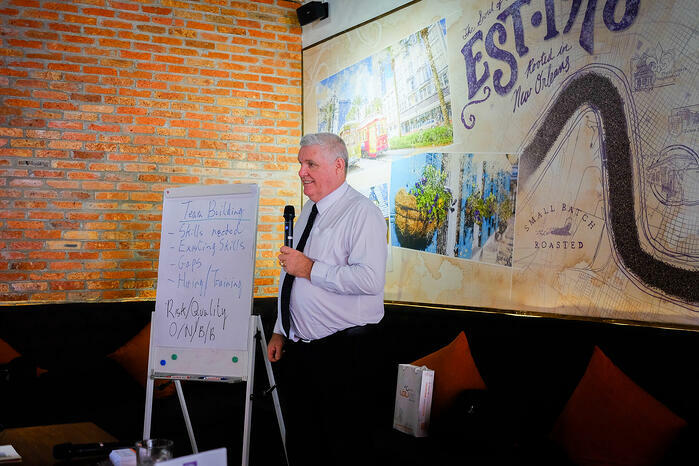 Speaking from years of experience, quality management, according to Brian, is not ticking off boxes on a check-list. This is when Brian introduced the Project Management Triangle - a model of a project’s constraints, a valuable tool to help the Project Managers prioritise tasks and make decisions. 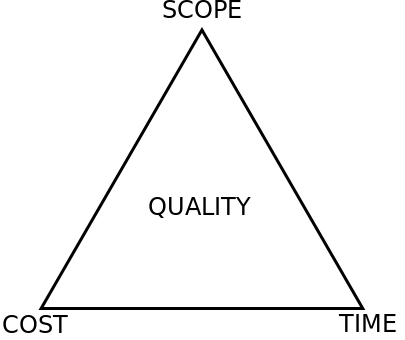 Cost, time and quality are the three elements that constrain the quality of any project and you are allowed to pick just two factors, you can’t have all three. Any change that happens to one factor can impact the remaining two constraints. For example, a project can be finished in a shorter time if the budget (cost) is increased, or you have to cut down on the scope of work. In another example, you decide to cut down on the budget, then the time and scope elements must also be re-adjusted or else the quality of your work will suffer. 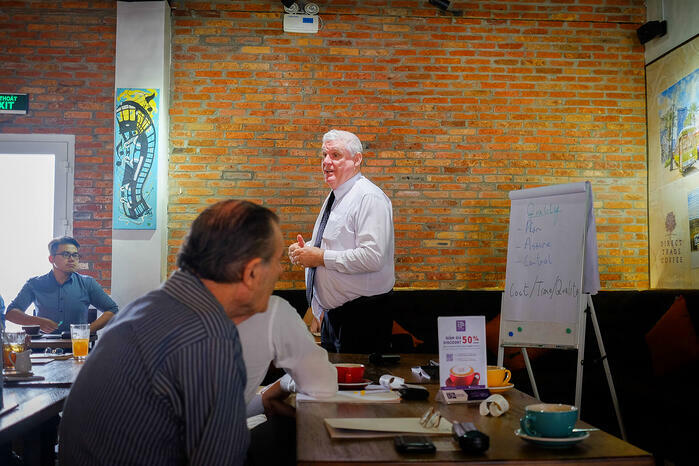 Brian briefed at the end of the Talk that in today’s world, despite the project managers’ effort, the technological domains are becoming more and more complicated, the focus of project managers is mostly tended to the human aspect. Human resource plays a more important role than other factors like materials, machines, etc. Therefore, make sure to hire people with high quality, do the best you can to set up the best team because if you get the wrong team, it will not work for you or for the project. 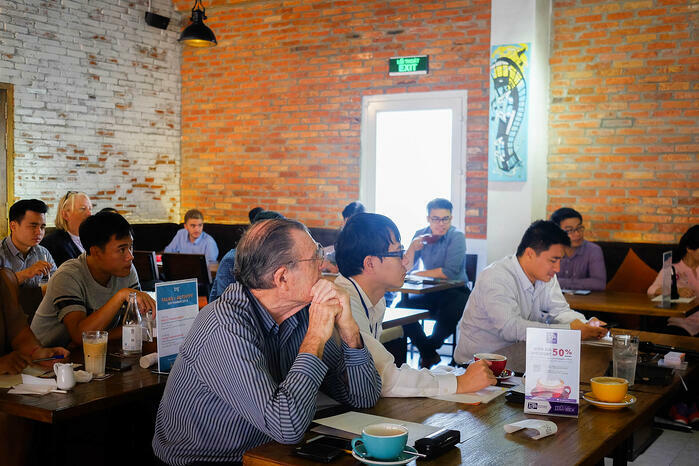 TRG Talk - Project Management is a monthly event that takes place on the first Thursday of the month. The purpose of the Talk is to equip the attendants with the much-needed knowledge as well as to open up new opportunities for future project managers. A good Project Manager must be able to identify problems and risks. He/ She also needs to know how to minimise these issues and is able to make the decision needed throughout the entirety of the project. Do you consider yourself a good project manager? Do you have the required skills and power to handle the situation and the people involved in your project? Globalisation is a widespread phenomenon causing modern organisations and teams across the world becoming increasingly multicultural. However, managing such a diverse squad is downright challenging. 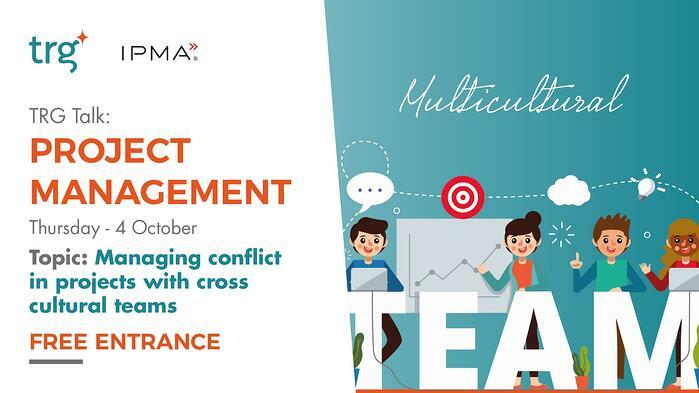 Lacking a common language and culture in a multicultural team can lead to difficulty in reaching a decision or having miscommunication issues due to each member has their own interpretation of things. TRG Talk – Project Management this month with the topic “Managing conflict in projects with cross cultural teams” will look at how international leaders maintain the relationships with their teams as well as analyse the primary elements that leaders need today to effectively manage and leverage the cultural differences. By registering to reserve your seat today, you also have the chance to receive a complimentary whitepaper, written by our experts: "Project Management Guidebook”. This event is limited to the first 20 people and FREE entrance, so hurry up and grab your seat!